Thyagaraja Aradhana, dedicated to Saint Thyagaraja, the greatest saint composer of Carnatic music, is observed in Paush month. Thyagaraja Aradhana 2020 date is January 11 to January 15. The music festival is held during this period for five days. The festival is held at Thiruvaiyaru near Thanjavur in Tamil Nadu and is also therefore known as Thiruvaiyaru Thyagaraja Aradhana. The festival is observed on the fifth day during the Krishna paksha or waning phase of moon in the Telugu month of Paush or Pushya. The 173rd Aradhana Festival Pancharatna Keerthana is on January 15, 2020. Accomodation: Many people have accommodation during the Aradhana at Thanjavur, which is around 13 km from Thiruvaiyaru. 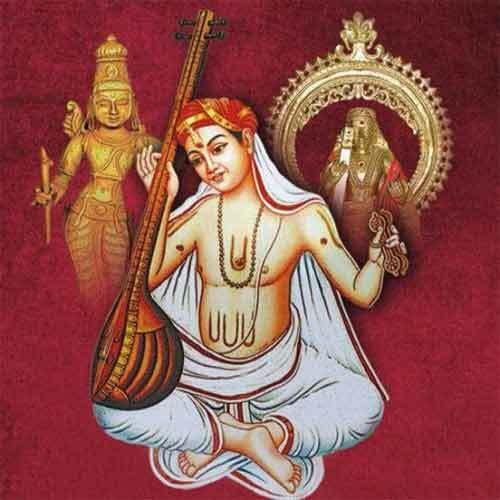 On the Thyagaraja Aradhana festival day, hundreds of Carnatic musicians pay their homage to the Saint Thyagaraja by rendering his ‘pancharatna kritis’ in chorus at his samadhi at Thiruvaiyaru. Another highlight on the day is the Unchavruthi Bhajan. Sri Thyagaraja attained Samadhi on the Pushya Bahula Panchami day or the fifth day after full moon in Pushya masam.